DETROIT — Detroit firefighters battled more fires during Angels' Night this year than in past years. There were 169 fires this year from Friday to Sunday, which is up 42% from 2009 when there were 119 fires. In 2008, there were 136 fires. 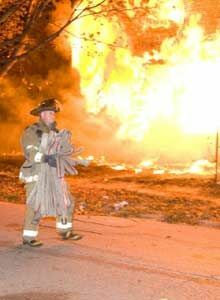 Photo Jason Frattini Detroit firefighters responded to 169 fires during Halloween weekend. One of the reasons for the increase is a higher number of vacant structure fires, said Detroit Fire Commissioner James Mack. About 42 percent of fires during the three-day period were in vacant structures, he said. Other types of fires this year include: occupied structures, 23%; rubbish, 22%; garages, 8%, and vehicles, 6%, he said. Fire officials told the Free Press over the weekend that things got so busy early Sunday, firefighters were told they couldn't take their breaks because of the volume of calls. No information was available from the fire department on how many fires are being investigated as arson from the weekend fires. There were no major injuries reported to firefighters. On an average night, Detroit firefighters fight about 40 fires, Detroit Mayor Dave Bing said. Detroit firefighters at a house fire on Angel's Night. The mayor credited 27,000 volunteers with helping to protect Detroit and the neighborhoods during the three-night period during a news conference this morning. Moving forward next year, city leaders said they will look for more help from the community to keep buildings from burning. "If you just watch your own block, I think we'll be OK," Mack said. Detroit police made 33 arrests during the three-day period. Most were traffic violations. Five people were arrested for operating under the influence of liquor and one for possession of a stolen motor vehicle. Police also issued 126 curfew violations on Oct. 29 and 30. The curfew in effect in Detroit made it unlawful for anyone under age 18 to be outside in any public place and unaccompanied by a parent or guardian from between 6 p.m. Friday through 6 a.m. Saturday and between 6 p.m. Saturday through 6 a.m. Sunday, according to the Detroit Police Department. There were more than 800 fires in 1984, the worst of what was then-called Devil's Night. Republished with permission from The Free Press.